How are the number of histogram steps decided in Statistics in SQL Server? Why is it restricted to 200 steps even though my key column has more than 200 distinct values? Is there any deciding factor? As we can see there are 53 steps in the histogram. Can someone tell me how these steps are decided? I'm going to limit this post to discussing single column statistics because it'll already be pretty lengthy and you're interested in how SQL Server buckets the data into histogram steps. For multi column statistics the histogram is only created on the leading column. When SQL Server determines that a statistics update is needed it kicks off a hidden query that reads either all of a table's data or a sample of the table's data. You can view these queries with extended events. There is a function called StatMan within SQL Server that is involved with creating the histograms. For simple statistics objects there are at least two different types of StatMan queries (there are different queries for quick stat updates and I suspect that the incremental stats feature on partitioned tables also uses a different query). TABLESAMPLE is documented but StatMan and step_direction are not. 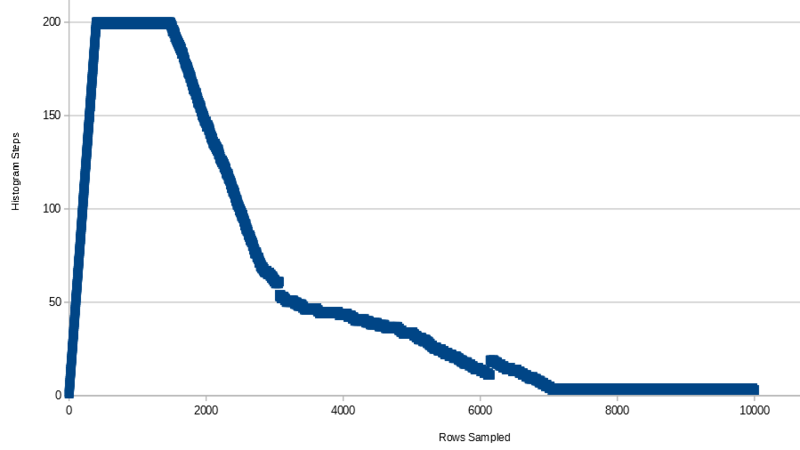 here SQL Server samples around 66.6% of the data from the table to create the histogram. What this means is that you could get a different number of histogram steps when updating stats (without FULLSCAN) on the same data. I've never observed this in practice but I don't see why it wouldn't be possible. Is it a problem that the histogram only has 3 steps? It looks like information is preserved from our point of view. Note that because the datatype is an INTEGER we can figure out how many rows are in the table for each integer from 1 - 10000. Typically SQL Server can figure this out too, although there are some cases in which this doesn't quite work out. See this SE post for an example of this. What do you think will happen if we delete a single row from the table and update stats? Ideally we'd get another histogram step to show that the missing integer is no longer in the table. That's a little disappointing. If we were building a histogram by hand we would add a step for each missing value. SQL Server is using a general purpose algorithm so for some data sets we may be able to come up with a more suitable histogram than the code that it uses. Of course, the practical difference between getting 0 or 1 row from a table is very small. I get the same results when testing with 20000 rows which each integer having 2 rows in the table. The histogram does not gain steps as I delete data. 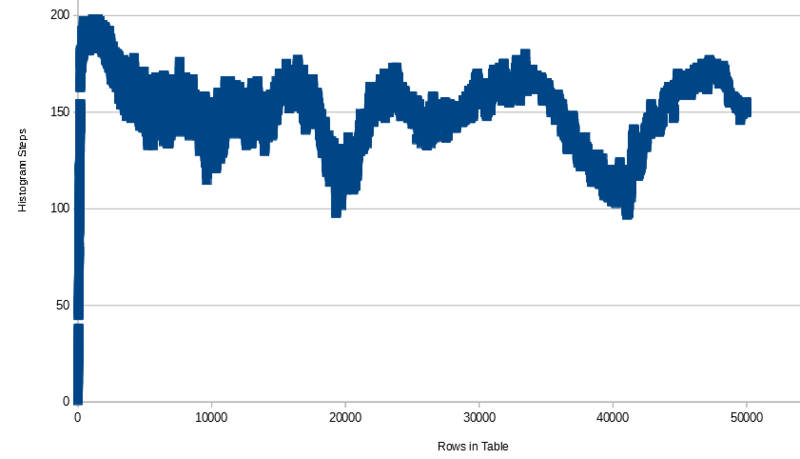 If I test with 1 million rows with each integer having 100 rows in the table I get slightly better results, but I can still construct a better histogram by hand. Let's test further with sequential integers but with more rows in the table. Note that for tables that are too small manually specifying a sample size will have no effect, so I will add 100 rows in each insert and gather stats each time up to 1 million rows. I see a similar pattern as before, except once I get to 637300 rows in the table I no longer sample 100% of the rows in the table with the default sample rate. 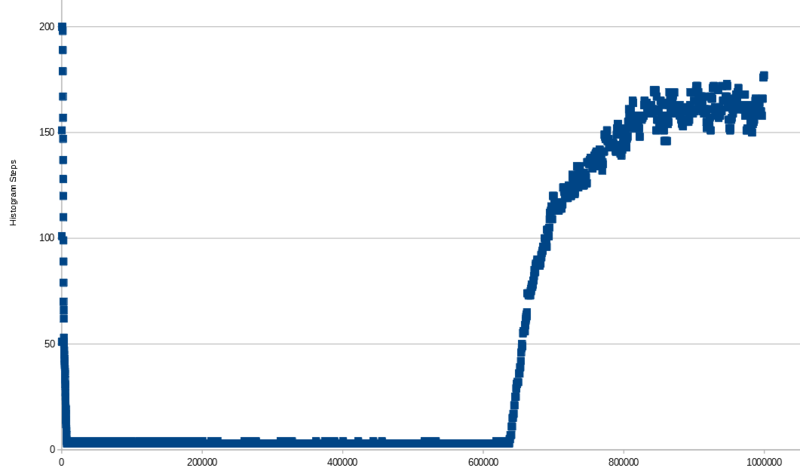 As I gain rows the number of histogram steps increases. Perhaps this is because SQL Server ends up with more gaps in the data as the number of unsampled rows in the table increases. I do not hit 200 steps even at 1 M rows, but if I kept adding rows I expect I would get there and eventually start going back down. The X-axis is the number of rows in the table. As the number of rows increases the rows sampled varies a bit and doesn't go over 650k. Now let's do some simple tests with VARCHAR data. Here I'm inserting 200 numbers (as strings) along with NULL. Note that NULL always gets its own histogram step when it is found in the table. SQL Server could have given me exactly 201 steps to preserve all information but it did not do that. Technically information is lost because '1111' sorts between '1' and '2' for example. No real difference from the last test. Now let's try inserting characters but putting different numbers of each character in the table. For example, CHAR(11) has 1 row, CHAR(12) has 2 rows, etc. As before I still don't get exactly 200 histogram steps. However, many of the steps have RANGE_ROWS of 0. Even when sampling with FULLSCAN, adding a single row can increase the number of steps by 10, keep it constant, then decrease it by 2, then decrease it by 3. SQL Server uses a general use algorithm to create the histograms. For some data distributions it may be possible to create a more complete representation of the data by hand. If there is NULL data in the table and the stats query finds it then that NULL data always gets its own histogram step. The minimum value found in the table gets its own histogram step with RANGE_ROWS = 0. The maximum value found in the table will be the final RANGE_HI_KEY in the table. As SQL Server samples more data it may need to combine existing steps to make room for the new data that it finds. If you look at enough histograms you may see common values repeat for DISTINCT_RANGE_ROWS or RANGE_ROWS. For example, 255 shows up a bunch of times for RANGE_ROWS and DISTINCT_RANGE_ROWS for the final test case here. For simple data distributions you may see SQL Server combine sequential data into one histogram step that causes no loss of information. However when adding gaps to the data the histogram may not adjust in the way you would hope. When is all of this a problem? It's a problem when a query performs poorly due to a histogram that is unable to represent the data distribution in a way for the query optimizer to make good decisions. I think there's a tendency to think that having more histogram steps is always better and for there to be consternation when SQL Server generates a histogram on millions of rows or more but doesn't use exactly 200 or 201 histogram steps. However, I have seen plenty of stats problems even when the histogram has 200 or 201 steps. We don't have any control over how many histogram steps that SQL Server generates for a statistics object so I wouldn't worry about it. However, there are some steps that you can take when you experience poor performing queries caused by stats issues. I will give an extremely brief overview. For most workloads, a full scan is not required, and default sampling is adequate. However, certain workloads that are sensitive to widely varying data distributions may require an increased sample size, or even a full scan. In some cases creating filtered statistics can help. You may have a column with skewed data and many different distinct values. If there are certain values in the data that are commonly filtered on you can create a statistics histogram for just those common values. The query optimizer can use the statistics defined on a smaller range of data instead of the statistics defined on all column values. You still are not guaranteed to get 200 steps in the histogram, but if you create the filtered stats on just one value you will a histogram step that value. Using a partitioned view is one way to effectively get more than 200 steps for a table. Suppose that you can easily split up a large table into one table per year. You create a UNION ALL view that combines all of the yearly tables. Each table will have its own histogram. Note that the new incremental statistics introduced in SQL Server 2014 only allows stats updates to be more efficient. The query optimizer will not use the statistics that are created per partition. There are many more tests that could be run here, so I encourage you to experiment. I did this testing on SQL Server 2014 express so really there's nothing stopping you. Not the answer you're looking for? Browse other questions tagged sql-server statistics or ask your own question. What is the quickest way to purge data?